The first issue of 30 DAYS OF NIGHT artists Ben Templesmith's first foray into art and writing quickly established the world of SINGULARITY 7 (IDW), a world where alien nanotech, riding a meteor, infests an everyman. 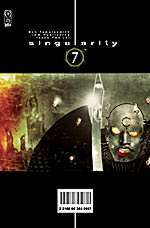 History calls him the Singularity, the focal point, able to manipulate anything at a molecular level. Being young and idealistic, the Singularity wants to change the world, and sets about purifying the air, curing disease, and ending wars. But that's only the backstory. Omaha Perez started out as a small press artist, until an irresistible idea turned him into a writer-artist. Alex Dueben seeks enlightenment from the creative force behind BODHISATTVA and the forthcoming PERIPHERY anthology. Omaha Perez has worked on some small press projects in the mid-'90s with writers like Robert Hunter and Richard Hell, but has been silent of late. 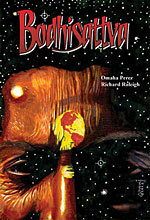 This year sees an end to that silence, with the release of his self published graphic novel BODHISATTVA. The story has its origin in a picture Perez drew years ago of a many-eyed man, and after a friend told him the story of Avalokiteshvara, the bodhisattva of compassion, the story began to fall into place. Perez is also writing, drawing and publishing an anthology book titled PERIPHERY, which will debut this summer. Discussing his recent absence from the small press scene, he explains, "The publishing gap was mostly about working full time and letting that sidetrack me. I'm not planning on letting it happen again, but then I was focusing more on my day job." It was also about Perez having an idea, but being nervous about not having written before, which he attributes to a combination of laziness and insecurity. "I had this raw idea and I just didn't sit down and try to develop it myself. I knew some good writers and tried to talk them into developing it for me. They had some interest but they said you know what you want to do, what do you need me for?" In Buddhism, a bodhisattva is an enlightened being who chooses to continue to be reincarnated as a man in order to help all creatures achieve enlightenment. In Perez's graphic novel, he posits that thousands of years ago a group of religious mendicants were visited by Hindu deities who transformed them. Two of those men resurface in present day San Francisco, where they interact with a number of people including a mental patient, an orderly, and a hospitalised man dealing with guilt over the death of his wife. It's a complex story that tries to be realistic and mythic at the same time, and Perez is apologetic for being unable to really explain his intentions with the story and its structure, explaining that he has trouble verbalizing what's in the book. "Part of my insecurity about the project led me to draw it without a full script. I thought it would be less work to just script it out once the pages were drawn, but in the end I had to add pages and change things. I learned that I never want to work without a full script again. I went to Richard Raleigh to polish the script in the end because he's an expert on Eastern mythology and religion, so he could fix a couple errors as far as names and a few inconsistencies." Perez may have taken a few years off from making comics, but he's always been making them. "The first thing I had published was PREY FOR US SINNERS, which I had done in my free time when I was in school. At the time I really had more a plan of being a freelance illustrator and doing comics when I could, not monthly superhero books but the ones that interested me. I went through an illustration program and sadly as I was going through the program I saw that the industry was dying. A lot of my teachers were big in the seventies and eighties and the things that were true for them had changed because the marketplace is much tougher and there's a greater use of stock illustrations. "I scraped by in my first year trying to do only illustrations and comics, but the money was really dismal. I ran into a guy at a comics convention who was a part of Alan Spiegel's group. He was working at Disney Interactive in LA and he invited me to submit some stuff. Off and on since 1995, I've been on staff somewhere except for some gaps of freelancing full time, but it's tough to turn down a good paying job." One of his first comics projects was such a vicious experience, it made Perez never want to work on another anthology. "SHOCK THE MONKEY was the worst. Millennium Publications promised us a page rate and I was putting it together and it sank without a trace. The publisher didn't pay most of us including myself and I still feel bad that people I'd gotten involved weren't paid even though it wasn't my fault. "RAW PERIPHERY was completely different. I was really proud that it looks like all the stories are illustrated by different people, but there was only one other artist beside myself. I don't really know if that's a good thing or bad thing. The other story was an excerpt of a project that Ann Nocenti and James Romberger developed for Vertigo and they were hoping to use the excerpt to shop it around. "After art school I moved to New York City, and while I was there I tried to track down Richard Hell because he was one of my punk heroes. Still is. I sent him the first comic I did, PREY FOR US SINNERS, and a note saying that I would really like to illustrate something of his, and the next week I got a phone call. He ended up giving me a piece called 'Dear Reader', a free verse poem he did in the seventies. The Robert Hunter piece was one I came up with that he added lyrics over, and it worked really well. It was about the many eyed man, and was the genesis of BODHISATTVA." Perez admits that self-publishing has downsides, foremost that it's his own money he's gambling with, but he prefers owning his own work, even though producing BODHISATTVA required some sacrifices from the start. "When I started on it, I was working full time and I stopped doing freelance illustration because it was hard enough to work full time, and I decided to spend that time just doing my comic. At the time I had the idea of it being 3-4 issues and would do the first one or two and send to publishers, but it took me so long to do it that I didn't want to send it out and then be unable to finish it in a timely manner. So by the time I finished it, it was a year and a half later because I was working nine to five, which is really more like nine to nine in the industry. "I finally finished and there was some interest from a few publishers, but in the end they all came back with verdict that they didn't think they could sell it, but I told myself that one way or another I was going to get it out. The internet has made things so much easier. The stuff I did in the nineties came and went because they were for small publishers without much marketing and as a recently graduated art student I didn't know about any of that so I couldn't help bring attention [to the books]." Perez has a plateful of future projects, starting with the upcoming anthology book PERIPHERY. "Back when I working on anthologies, I always wanted to make a book that would be more for a general audience that has different writers but with mostly my own artwork. "Steve Niles has two stories, a great vampire story he did with Brian Horton, which is some of Brian's best comic work, and a sci-fi comic that I drew. There's a story by Eli 5 Stone who took over The Tick when Ben Edlund left. We're previewing CENOZOIC by Mark Fearing who's a great cartoonist. "If I'm known for anything it's for BODHISATTVA, but hopefully [PERIPHERY] will help and get out to places and people more than a graphic novel can, and $3.50 for a forty-eight-page book is reasonably cheap. I don't have a set schedule, but I'd like to do it several times a year and just solicit the book when it's complete." If that weren't enough, Perez has already scripted his next big project, HOLMES, an irreverent take on Sir Arthur Conan Doyle, which is previewed in the back of BODHISATTVA. "It was planned to be finished this year, but that's looking unlikely. Things are moving at a snail's pace. My wife and I had a baby a few ago, so I'm going to serialize it a chapter at a time rather than wait to have to get it out." Note: Alex Dueben is a Connecticut-based freelance writer. Comics may not be widely read, but the artform has some friends in high places, including novelist Michael Chabon and filmmaker Robert Rodriguez. By BEN WOOLLER. It took seven years for James Joyce to write ULYSSES, and though he had a book of short stories, a book of poetry, a play and a novel to his name, no one would publish it. A few chapters, heavily edited, were printed, but faced controversy and litigation. Ezra Pound, his friend and long-time supporter, insisted Joyce move to Paris, a place more receptive to the avant garde, where ULYSSES might be published as a whole. Sylvia Beach, who had recently opened a bookshop called Shakespeare & Co on the Rue Dupuytren, had the same idea, and in 1922, 1000 numbered copies were printed. Winston Churchill pre-ordered a copy. ULYSSES was embraced by most of Joyce's contemporaries. DH Lawrence derided the book as obscene, while Virginia Woolf likened it to "the scratching of pimples on the body of a bootboy at Claridge's", but others leaped to defend it. Pound and TS Eliot were already speaking of the book as if it were a classical masterpiece. Ernest Hemingway wrote that it was "a most goddamned wonderful book". F Scott Fitzgerald was willing to jump out of a window to prove his reverence to Joyce (Joyce asked him not to), while William Faulkner went to a cafe only to gawk at Joyce, unable to approach him. Love it or hate it, Joyce's contemporaries understood what ULYSSES was. I find it hard to picture all this. I don't know why. It's not just the passion of Joyce's supporters, Scott Fitzgerald's threat of suicide, Faulkner's awe-struck paralysis, it's the image of these writers who produced some of literature's masterpieces backing an author whose work had been rejected, and loathed by mainstream society. And this was despite the possible negative repercussions it could have on their reputations. US postal authorities had been burning Joyce's books as they arrived in the country, yet these prominent writers came forward and gave it their blessings. I can't help but liken the above to what's happening now with comics. Look beyond the trend of "celebrity" writers, and there's a who's who of pop culture heavyweights stepping into the ring and backing comics. This isn't just genre writers like Joss Whedon and Richard Morgan doing superheroes, although they're a decent part of it. This is mainstream writers like Michael Chabon, rock stars like Rob Zombie, and filmmakers like Frank Darabont writing comics, and, one would hope, bringing some of their audience with them. The director of the brilliant SHAWSHANK REDEMPTION writing a HELLBOY story? This I have to see! 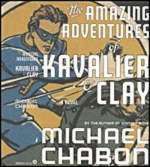 Ever since Michael Chabon used comics as a central element in THE AMAZING ADVENTURES OF KAVALIER & CLAY, he's been welcomed into the comic community as one of the more vocal exponents of comics in the mainstream. While his keynote speech at the Eisner Awards was primarily about kid's comics, he did have this to say: "Not only are comics appealing to a wider and older audience than ever before, but the idea of comics as a valid art form on a par at least with, say, film or rock and roll music, is widely if not quite universally accepted." I wonder if it makes people not familiar with comics sit up and think, 'Hey, this guy won a Pulitzer! He must know what he's talking about'. MAUS also famously won a Pulitzer, and I recently saw a review of it in one of Australia's few literary magazines Quadrant, so that's nice to see, especially in light of American press such as Entertainment Weekly and The New York Times covering comics, which is possibly one of the reasons comics are being gradually accepted. Spin even has a last page comic strip, featuring events in a rock stars' lives as drawn by the likes of Paul Pope, Travis Millard and Phillip Bond. And McSweeney's, that barometer of literary hipness, recently dedicated an entire issue to the form, edited by Chris Ware and featuring essays by Chabon and John Updike. Filmmakers seem to be comics' most kindred spirits. Steve Grant calls comics "paper movies". Directors like Guillermo del Toro, Sam Raimi and Robert Rodriguez have demonstrated as much with their detailed film adaptations of well-known and not-so-well-known comic properties. While Raimi is already a cult figure, every man and his dog has seen SPIDER-MAN 2 regardless of whether or not they read the comic, and Raimi's affection for the character is demonstrable. Del Toro has now made two comic-based movies, HELLBOY and BLADE 2, but he started out making beautifully chilling and highly acclaimed horror films. My fiancée doesn't know all that much about comics, but she's going to see HELLBOY when it's finally released in Australia because it's by "the guy who did THE DEVIL'S BACKBONE", one of her favourite films. 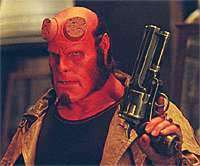 Del Toro wrote the HELLBOY script and directed the film with Mike Mignola's input every step of the way. They called it their "Harryhausen movie". I cheated and watched the opening scene at my brother's house, grainy and shaky in an obvious handheld camera sort of way, but it looked like it came straight out of the comic. I had to stop watching, it all looked so... perfect. I want to savour the details, the shadows, the Mignola-esque statues, and Nazis, and big Lovecraftian gods on the big screen. For years Robert Rodriguez has been trying to get a MADMAN film off the ground. In lieu of MADMAN, he's hard at work on his SIN CITY adaptation, and he revealed at the San Diego Comicon that he's using the actual comic panels, Frank Miller's own art, as the storyboards. 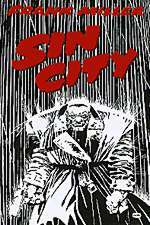 He publicly stated in interviews that he's not interested in making ROBERT RODRIGUEZ'S SIN CITY, he wants to make FRANK MILLER'S SIN CITY. He went so far as to hire actor Josh Hartnett for the "test" footage (which was the story "The Customer is Always Right"), following Miller's exact layouts, lighting and dialogue. Having been burnt by Hollywood before (on ROBOCOP 2 and 3), Miller was hesitant, but upon seeing the test he was impressed, and is even directing sections of the film. Not only having an all-star cast (Benicio del Toro, Bruce Willis, Clive Owen, Brittany Murphy, Elijah Wood, just to name a few), the black and white film will have the characteristic Lynn Varley splashes of colour. And to top it off, Rodriguez hopes SIN CITY will get people reading the graphic novels. Luckily they're more accessible than the 40-year mess that is the X-MEN or SPIDER-MAN. While putting their talents and names behind comics isn't a risky a prospect as it was for someone like F Scott Fitzgerald to back a book as genuinely controversial as ULYSSES, it is still a sign that people in positions to promote comics to a wider audience are as passionate about comics as the everyday reader is. It already looks like their promotion is getting people to sit up and take notice. Fingers crossed. End Of The Line For CrossGen? In the race for new comic publishers to burn out like a dotcom start-up, CrossGen comes a resounding first. Resident expert Hector Reeder powers up his sigil to reveal why Mark Alessi's bold venture is winding up last everywhere else. Boy, do I hate superheroes. Then I'm afraid you're in a bit of a minority, at least as far as current comics-reading audiences are concerned. What are you, a filthy black-and-white indie reader? Not likely! I'm a fan of fantasy, horror, martial arts, spy stories and other genre fiction. But I'd like them on shiny paper and in colour, please. Ah. Shame about CrossGen, then, isn't it? Why, yes. The publishers of RUSE, BRATH, EL CAZADOR and other titles have run into, shall we say, operational difficulties. Let me guess. Late shipping titles? Talent defections? That's certainly part of it, but their main problem right now is debt. Big, fat, serious debt to the tune of over three million dollars, half of which is due to their printers, Quebecor. Three million dollars? Didn't anyone notice? People certainly did notice, not least CrossGen's creative staff - many of them noticed a distinct lack of cheques for work done a long time ago, for example. But the writing concerning CrossGen's long-term future wasn't daubed on the wall until December 2003, when they cancelled nine titles - including their four launch titles, and the George Perez showcase book SOLUS. But hang on, I thought they'd been doing well with their new, "non-Sigil" comics. Aye, and there's the rub. 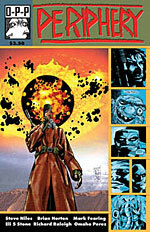 The likes of EL CAZADOR, KISS KISS BANG BANG and ABADAZAD have sold rather better than the CrossGen Universe titles, and many people have speculated that this is largely to do with their lack of tie-ins to the "Sigil-verse". But it's been a case of too little, too late, and now these books may never see print again. EL CAZADOR and KISS KISS BANG BANG are already on a somewhat euphemistic "hiatus", and the recently-announced horror title RAVEN HOUSE has already lost its artist, Leonardo Manco. That was careless. Have they looked behind the sofa? Okay, okay. I get it. CrossGen's losing its creators. It can always hire more, right? Not if there are no books for them to work on. In addition to the above-mentioned titles, SOJOURN, WAY OF THE RAT and BRATH have also met with the axe, and this is in addition to the recent cull of Sigil-verse launch titles such as MERIDIAN and NEGATION in the recent "Negation War" crossover. Besides, it's not just the creative teams who are jumping ship. Bill Rosemann - formerly Our Man At Marvel, and latterly Crossgen's VP of Publishing - has packed up his desk, swiftly followed by Chris Oarr, VP of Marketing and Sales. But it can't be all doom and gloom, surely? All these staff quitting can only mean that CrossGen will have more cash to pay its creditors off with. You'd think so, wouldn't you? But it seems it's all a little late for that. On June 21st 2004, Newsarama ran the story that Crossgen was intending to file for Chapter 11 Bankruptcy. Later the same day, a copy of the filing was posted. Chapter 11? That sounds pretty close to the end of the book. Oh, very droll. But it could be worse - "doing a Chapter 11" allows CrossGen to continue to operate as a going business concern while reorganising its finances. It's the same option Marvel chose when it was in financial straits in the late '90s. Unlike Marvel, however, CrossGen doesn't have a stream of movie merchandising revenue to shore up the bank balance, and so it's back to the old investor hunt again. Meanwhile, the entire staff has been laid off (save for a skeleton crew, mainly consisting of accountants and lawyers) and the infamous "CrossGen Compound" offices have been closed. So we might never see another issue of THE FIRST? Note: Hector Reeder is an expert. The Philippines comic book is still alive and fighting against the invasion of American comics. The country is home to dozens of talented comic book creators but unfortunately, the comics stands are dominated by foreign names. Still there are some like Zach Yonzon, showing the way to fight back. Like what heroes are supposed to do against the odds. Zach Yonzon is editor in chief of Mango Comics, a new comic book company based in Tagaytay that recently released a new version of the Filipino classic, Darna. He said in a recent interview, "The readership of comics remains constant and, we believe, is slowly growing again. This is evidenced by the success of [Pinoy] companies like Culture Crash, PSICOM, and Summit Publishing, who have great titles out on the shelves." So who are the Filipino comic creators? "The only real background you need to become a comic book creator is to have an appreciation of the medium. It would probably help if you had some artistic training or training as a writer, but it's not a requirement," explains Yonzon. "The truth is the comic book industry is so diverse that virtually anybody can put out a comic book. There're no credentials required." However, Yonzon admits, "The Philippine comic book industry isn't a terribly financially rewarding industry except for the lucky few." Filipino comic book creators earn only about a tenth of what foreign creators earn from the big publishers abroad. "Comic book creation isn't something you get into for financial reward, at least not in the initial stages. It's really an industry of love," confesses Mango's creator. "People do this here (Philippines) because they want to, because they love the medium, because they want to create, to inspire. This is the best way to nourish the creative spirit." Dont try this in $ingapore. Malaysian artist Sonny Liew's debut for Vertigo is generating very favorable reviews. My Faith In Frankie should be in your comic shops this week. Highly recommended. Note: This article from ninthart.com is Ideological Freeware. The author grants permission for its reproduction and redistribution by private individuals on condition that the author and source of the article are clearly shown, no charge is made, and the whole article is reproduced intact, including this notice.